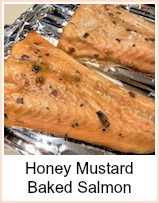 This recipe for baked salmon is very easy to put together. Once prepared, it looks after itself. The quantities will serve 4 but you could easily adjust it to serve 2 or more. You can use fillets or steaks - the cooking time will be about the same. Parboil the potatoes for 10 minutes. Slice the courgettes into 1/4 inch (.5cm) slices. Put into a sieve/colander and sprinkle a teaspoon of salt over - give the sieve a shake and allow the courgettes to rest for about 10 minutes. This will remove some of the water and make them less bitter. Cut the peppers into 1/2 inch (1 cm) chunks. Drain the potatoes and put all the vegetables into a large roasting tin. Season with a few twists of black pepper and drizzle some olive oil over. Mix the vegetables together to distribute evenly. Bake for about 25 minutes then remove from the oven. 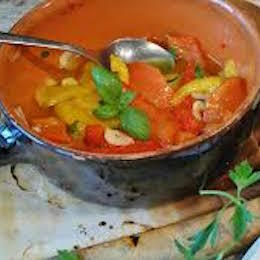 Stir throughly again - crush the tomatoes gently to release some juices. Place the salmon on top of the vegetables and return the dish to the oven. 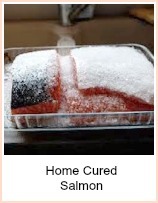 Bake a further 20 minutes - test if the salmon is cooked by pressing it with your finger - it should be firm to the touch and paler in colour. If it's not ready, then cook a further 5 minutes. 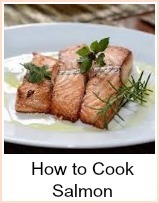 Serve immediately - arrange a portion of cooked vegetables on the plate and place the salmon on top. Super easy to make Baked Salmon with Mediterranean Veg.